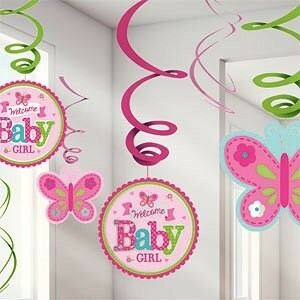 These welcome baby girl party decoration is wonderful, 12 hanging swirls in different sizes to hang about the buffet table, cake table or entrance way. These welcome baby girl party decoration is wonderful, 12 hanging swirls in different sizes to hang about the buffet table, cake table or entrance way. 3 Swirls with paper cutout 17cm 3 Swirls with paper cutout 12cm 6 x Foil Swirls 45cm This new range for baby showers is perfect to welcome a baby girl into your family, beautiful colours with a butterfly and flower design there are lots of fabulous disposable baby shower tableware to choose from along with some fabulous baby girl party decorations.